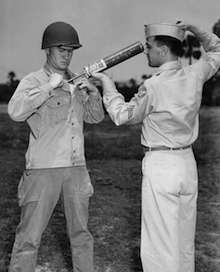 U.S. soldiers demonstrate DDT hand spraying equipment. DDT was used extensively after World War II in agriculture and for mosquito control, and was banned in the United States in 1972. Image courtesy of CDC Public Health Image Library. A team of researchers has found that patients with Alzheimer's disease have significantly higher levels of DDE, the long-lasting metabolite of the pesticide DDT, in their blood than healthy people. Patients with Alzheimer's disease have significantly higher levels of DDE, the long-lasting metabolite of the pesticide DDT, in their blood than healthy people, a team of researchers has found. In a case-control study involving 86 Alzheimer's patients and 79 healthy elderly controls, researchers found that DDE levels were almost four times higher in serum samples from Alzheimer's patients than in controls. Having DDE levels in the highest third of the range in the study increased someone's risk of Alzheimer's by a factor of four. The results were published Monday, Jan. 27 in JAMA Neurology. "This is one of the first studies identifying a strong environmental risk factor for Alzheimer's disease," says co-author Allan Levey, MD, PhD, director of Emory's Alzheimer's Disease Research Center and Betty Gage Holland chair of neurology at Emory University School of Medicine. "The magnitude of the effect is strikingly large -- it is comparable in size to the most common genetic risk factor for late-onset Alzheimer's." The lead author is Jason Richardson, PhD, associate professor of environmental and occupational medicine at Rutgers-Robert Wood Johnson Medical School. Richardson collaborated with Dr. Levey at Emory University Alzheimer's Disease Research Center and Dwight German, PhD at the University of Texas Southwestern Medical School's Alzheimer's Disease Center, replicating the findings in independent samples from two regions of the country. The researchers have also identified a plausible mechanism by which DDE and DDT have Alzheimer's-related effects on the brain. Exposure of cultured neural cells to high concentrations of DDT or DDE – comparable to those seen in highly exposed humans -- increases levels of the protein that is a precursor to beta-amyloid, the main component of plaques found in the brains of Alzheimer's patients. In the United States, DDT (dichlorodiphenyltrichloroethane) was used extensively in agriculture and for mosquito control from the 1940s until it was banned in 1972. Concerns over DDT's effects on wildlife, especially birds, played an important role in the history of the environmental movement. Around the world, DDT's use continued in many countries until more recently. Public health authorities have said that DDT was critical for controlling mosquitos that spread malaria in several countries. For this reason, the World Health Organization called for DDT's reintroduction to fight malaria in African countries in 2006. "We are still being exposed to these chemicals in the United States, both because we get food products from other countries and because DDE persists in the environment for a long time," Richardson says. In addition, DDT's half-life in the body is very long, between 8 and 10 years. Because of continuing exposure and its long half-life, the DDE metabolite accumulates in tissues as people age. This observation could help explain why age is by far the largest risk factor for Alzheimer's disease, Levey says. The findings on DDT and Alzheimer's emerged from previous research conducted by Richardson, with Emory and UT Southwestern colleagues, on the connection between another pesticide, beta-HCH, and Parkinson's disease. Richardson first began examining the pesticide connection when he was a postdoctoral fellow at the Emory Center for Neurodegenerative Disease with Gary Miller, PhD, now associate dean for research at Rollins School of Public Health, between 2002 and 2005. "In our previous study on Parkinson's, we used samples from patients with Alzheimer's as a control," Richardson says. "We found that in the Alzheimer's samples, beta-HCH and other pesticides were not elevated, but we did find elevated levels of DDE. So we decided to look at DDE more closely." In the current study, DDE levels weren't the sole determinant of whether someone gets Alzheimer's; some Alzheimer's patients had non-detectable levels of DDE and some healthy control samples had DDE levels that were relatively high (top third). The researchers say that genetic risk factors may combine with environmental exposures to drive disease development. "Measurement of serum DDE levels accompanied by ApoE genotyping might be a useful clinical measure to identify individuals who may be at increased risk for Alzheimer's," the authors write. "An important next step will be to extend these studies to additional subjects and replicate the findings in independent laboratories," Levey says. "The potentially huge public health impact of identifying an avoidable cause of Alzheimer's disease warrants more study - urgently." The research was supported by the National Institutes of Environmental Health Sciences (P30ES005022; T32ES07148, R01ES015991), the National Institute of Neurological Disorders and Stroke (R21NS072097), and the National Institute on Aging (P30AG012300, P50AG05681, P50AG025688). Reference: J.R. Richardson et al. Elevated serum levels of p,p'-DDE, the metabolite of the pesticide DDT, are associated with increased risk for Alzheimer's disease. JAMA Neurology (2014).